I have known Brianna for a long time, so there are many things with which she is linked: Eddie Izzard, The General by Dispatch, Napoleon Dynamite, The Hold Steady, and Sarah Vowell. I don’t remember if I heard about Assassination Vacation because of Brianna, but I remember finding out she was reading it at around the same time. 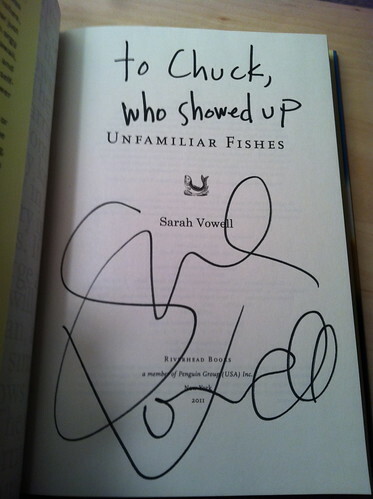 It was the first Sarah Vowell book I read, but not the last. I just checked the inside cover of her latest book, and I’ve read every one in the bibliography provided there. 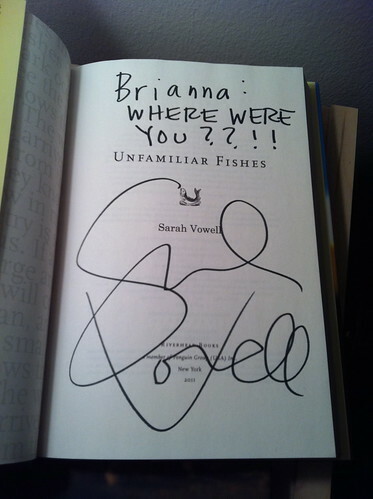 When I found out Sarah was doing a reading/signing of her new book, the first thing I did was cancel my previous plans for that night, and the second thing I did was invite Brianna to come with me. My previous plans were going to see a movie with my coworkers on the company dime, which was easy to get out of. Unfortunately, to set those plans, I had to cancel my previous previous plans: a standing board game night with Brianna and her fiance. Naturally, she gave me crap about canceling our original plans. So when I invited her to something on the same night, having canceled those plans for something new, I got even more. After the reading there was a Q&A, and she got some decent questions, and answered them in delightfully funny ways. After that, she signed copies of the book for anyone who stuck around.